Cleans + polishes. With plant-based powergreen® technology. Cruelty-Free International. We polish our stone till it rocks. 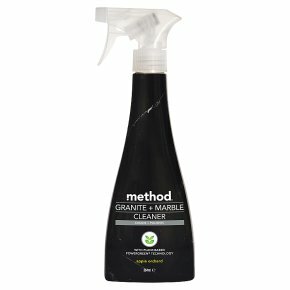 Give your story surfaces some extra TLC with our surface safe, plant-based granite + marble cleaner. It safely cleans, polishes + shines granite, marble and any other sealed stone without the streaks or stress. Don't be alarmed if you find yourself buying a garden's worth of marble statues just so you have more reasons to clean, it happens. Granite, Marble, Stone To use: spray on soft cloth. Wipe. Buff with a dry, clean cloth. Not for use on floors Psst: it's always a good idea to test in an inconspicuous place first.